LOS ANGELES - Yao Ming scored 39 points and the Houston Rockets overcame Kobe Bryant's 53 points to beat the Los Angeles Lakers 107-104 in overtime Friday night. Bryant, who went 19-of-44 from the floor, hit a dramatic 3-pointer late in regulation to help the Lakers catch the Rockets, but he missed another 3-pointer as time was running out in overtime. Yao, who had 11 rebounds, went 17-of-21 from the free throw line and 11-of-18 from the floor. Tracy McGrady had 30 points and 10 assists for the Rockets, with 15 points coming at the line. Rafer Alston added 19 points and made a pair of free throws with 15 seconds left for the final margin as the Rockets outscored the Lakers 7-0 to end the extra period. Bryant scored 25 of the last 28 points for the Lakers, who trailed 88-76 with 4:31 left in regulation before he led them back. Bryant scored 50 or more points for the fifth time in the last seven games, for the eighth time this season and 19th time in his career. But he bounced a 3-point try off the rim and the Rockets rebounded as overtime ended. Yao intentionally fouled Kwame Brown with 16 seconds remaining in regulation, and Brown missed both free throws. But Bryant got the long rebound off to the left and made a fallaway 3-pointer to tie it at 95. McGrady then missed a jumper, with Bryant guarding him, as time ran out in regulation. Bryant was coming off a 23-point game in an 88-86 loss to Memphis. He had scored at least 40 in the previous five games, including at least 50 in the first four. He scored 65 in one of those and 60 in another. Lamar Odom had 16 points and 17 rebounds for the Lakers before fouling out with 15 seconds left in overtime. Chuck Hayes had 14 rebounds and six points for Houston. Bryant had 25 points by halftime, but was the only Lakers' scorer in double figures and the Rockets were up 53-48. 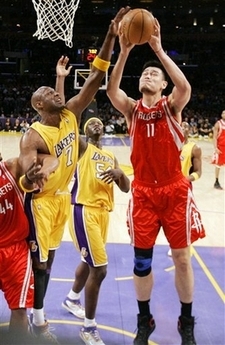 Yao had 20 first-half points, going 12-of-13 from the free throw line, and McGrady added 16 points. Yao scored 12 points in the first quarter to help Houston take a 31-22 lead. Bryant had 10 points on 4-of-9 shooting for Los Angeles. Notes:@ Lakers coach Phil Jackson said playing 82 regular-season games causes injuries, and suggested that the NBA consider cutting back. "Our league has to discuss the number of games we play. Eighty-two games is too many," he said before the game. "They train year-round. During the season they play 3 1/2 games a week or seven games in 14 days. They play when they are fatigued and that's when they get hurt. I've cut practices to 45 minutes. I've never had a team with this many injuries. Guys need time to recharge and rehab." ... Houston held Bryant to 20 points on 6-for-18 shooting, in the Rockets' 102-77 win on Jan. 10.